I was never really into stop-motion animation all that much. After being thoroughly charmed by Wes Anderson's take on Roald Dahl's Fantastic Mr. Fox, I decided to check out the other acclaimed stop-motion animated hit film of the year, Coraline on Blu-ray. The film was written and directed by the master of the medium, Henry Selick (The Nightmare Before Christmas), who worked on early conceptual designs on Fantastic Mr. Fox before leaving to work on this film. Coraline is based on the fantasy novel by famed author, Neil Gaiman. The film is simple but thoroughly delightful in its imagery and animation design. The animation used is much more sophisticated and polished compared to other stop-motion films and parallels CGI animation slightly in parts but maintains the whimsy and charm of stop-motion. The visuals really stand out in high definition. The characters and structure are pitch perfect for the adaptation. Parts of the story drag and some characters seem kind of distant but it lends itself well to the tone of the film. The voice acting is pretty spot on from the likes of Dakota Fanning, Teri Hatcher, John Hodgman, Keith David, and Ian McShane. 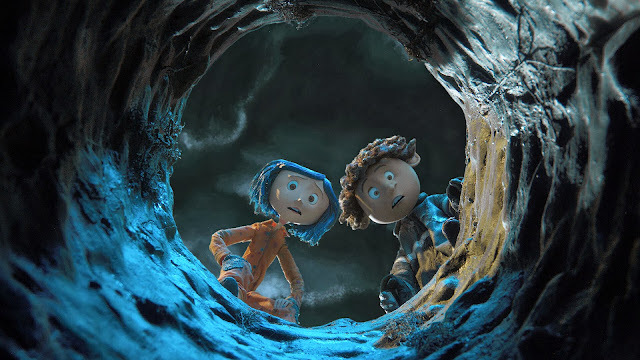 Coraline is emblematic of tradition stop-motion animation. Selick uses all his cinematic tricks to craft a well-rounded and constructed story about a curious little girl who ventures into a twisted world of imagination when she is bored in the vein of Lewis Carol. In true fashion, this is a sweet, charming experience for kids and adults. Coraline is a very well-made, enjoyable film.